“Transcendental meditation (TM) has been having a renaissance in recent years: Celebrities, businesspeople, and regular folk are practicing it in record numbers. Last week, the David Lynch Foundation, the major non-profit champion of TM, hosted an event in New York City at which public figures like Arianna Huffington, Robin Roberts, and Cynthia McFadden discussed the transforming role of TM in their lives. They made compelling arguments for what the practice had done for them, as previously harried and stressed-to-the-max businesspeople – they may still be stressed, but at least they’re able to balance it with a sense of calm. But the Foundation has a larger goal: To bring TM to schoolchildren, domestic abuse survivors, veterans, and prison inmates to help give them tools to process their trauma and reclaim the capacity to live fulfilling lives. And that’s not a bad goal to have. The practice does seem to be helping a great number of people. Roth says the Foundation has helped bring meditation to half a million school children all over the world, and hopes to bring it to three million adults and children in the next five years. 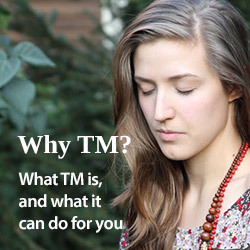 It’s also taught TM to 2,000 veterans and as many female victims of domestic abuse through Family Justice Centers across the US, where it’s offered free of charge. The Foundation has also just begun to teach the perpetrators of that abuse, Roth says. The Foundation can barely keep up with all the requests it has from school systems, family centers, and prisons to teach TM.